Steam Curators are part of Valve’s plan to help players sift through the gazillion PC games on their service – individuals or groups who’ll recommend games to appear on your front page. 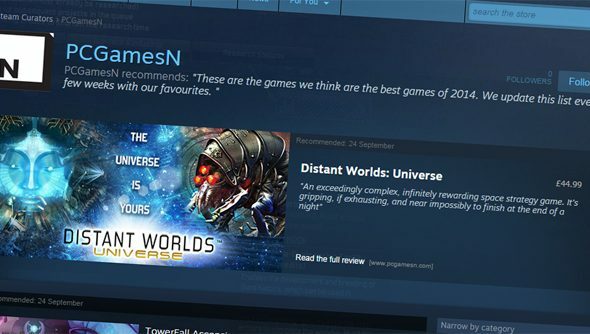 The idea has already yielded results – allow me to surreptitiously slide a link to the PCGamesN Curator page across the desk between us – but early critics worried that the curation system was open to exploitation by unscrupulous developers. That a Curator’s critical judgement might be informed by, say, a crisp £50 note faxed through to their study. Valve have wised up to that possibility, and now require Curators to disclose conflicts of interest in their recommendations. The rule can be found at the very bottom of Steam’s explanatory page about Steam Curators. “We have a couple of rules that govern the use of the Steam Curator feature,” write Valve. So nobody’s precluded from making a career out of paid recommendations to Steam users – but we’re going to know all about it if they are. Anybody can be a Steam Curator. They’re each tied to a Steam community group, and will publish reviews based on their own tastes. As a user, you can dig up Curators with interests similar to yours and make their recommendations a part of your home page, where you can comment on and rate them. How’ve you found your new front page, with the discovery queue, updated search system and all that?